Tell 'em all--"Hands off our healthcare!" As you probably know by now, the Blue Dog Democrats have sold out to the Pelosi-Obama alliance in the House and it appears an Obamacare bill will be voted out of committee by the end of this week. With supermajorities in both the Senate and the House, we're much closer to a government-run health care system than we were just yesterday. But now is not the time to lose heart, now is the time to step up the pressure on our elected officials in DC. President Obama has staked his presidency on passing his vision of health care reform. He's campaigned for it for weeks straight and it's done him more harm than good. His approval ratings have crashed, only 23% believe Obamacare will reduce health care costs, and Republicans have led in Rasmussen's Generic Congressional Ballot for five weeks straight. We're winning the battle against the President's dream of a government run health care system. This sell-out by the supposedly conservative Blue Dogs is nothing more than a last ditch counter attack by Pelosi-Obama Democrats in this political war for our American way of life. These rallies will be held at every local office of every Congressman in the country. Now is the time to stand up and be counted. It's the time to demand your representatives understand they work for us. It's our money they're wasting and our lives on the line if they're allowed to create the bureaucratic labyrinth envisioned by the Pelosi-Obama wing of the Democratic party. Posted by John M. Allison III : Post Link --> 7:41 AM 0 Comments - Share Yours! Your loved one denied surgery - a government bureaucrat decided it isn't needed. Your hard-earned tax dollars funding abortions liberals in Congress decided they are needed. Congress will soon vote on President Obamas healthcare bill a bill limiting our choices to preserve life and expanding the choice to end one. Our greatest generation denied care. Our future generation denied life Call your Senator. Tags: abortion, elderly, FRC, government healthcare, Socialized Medicine, video To share or post to your site, click on "Post Link". Please mention / link to America's Best Choice. Thanks! Posted by Bill Smith : Post Link --> 7:00 AM 0 Comments - Share Yours! It's simple and straightforward. Read and understand the yoke you are placing around our necks and give us ample time to examine it for ourselves before you limit our choices and place our health care system at the mercy of federal bureaucrats. Not a single Democrat has signed the pledge! Ask yourself why? We also need to ask why every Republican hasn't signed yet. Call your Congressmen and Senators and ask what's keeping them from taking this pledge. For updates on this post visit Why Won't They Sign? Posted by John M. Allison III : Post Link --> 12:34 PM 0 Comments - Share Yours! What about transparency Mr. President? Sometimes I think the President and his cohorts must think the words transparent and opaque are synonyms. It's so often they practice the latter and claim the former they must be truly confused. Another case in point leapt out at me today as I perused the headlines. We (conservatives) are making progress in our campaign to keep the government's hands off our health care. Reuters is reporting public support for Obama's plan for a government-run system is eroding. In April, 57% of adults polled supported the President's reform plan. Today, less than half--49%--believe another government bureaucracy is needed to make our health care system more efficient and less costly. The number of Americans who disapprove of such a mess has risen from 29% to 44% since April. For those of us who don't want to see the health care system run by the same crowd who runs Social Security, Medicare, the Post Office, and the TSA's airport security, this is great news. Support is slipping for Obama's plan to seize control of another 1/6 of the American economy! What's the White House response to the faltering support? I'll give you a hint. It's the opposite of transparency! An AP story released today with the too benign headline "White House Putting Off Release of Budget Update." Buried inside one discovers this report is typically released around the middle of July. But Obama has decided to delay it's release until the middle of next month. Why? Let's see, that will be after his deadline for Congress to pass his Socialized Medicine plan. After Congress leaves for its August recess. The release of the update — usually scheduled for mid-July — has been put off until the middle of next month, giving rise to speculation the White House is delaying the bad news at least until Congress leaves town on its August 7 summer recess. Unemployment is rising faster than the President predicted, the deficit is rising faster than he said it would, and the economy wasn't stimulated by his so-called "stimulus" package. You can bet if this budget report contained good news, the White House would release it as quickly as possible to counter so much bad news. But instead, it's being pushed back while Obama continues his propaganda campaign to create another monstrous bureaucracy to distribute health care in America. Why? Because it's bad news and it won't complement his propaganda on health care reform! He's hiding it because he knows it will impede his campaign to have the government decide which sick Americans get to go to the doctor, which surgery will benefit a patient enough to justify its cost, which patients are too old to receive life-saving treatments because some bureaucrat determines the cost-benefit ratio just isn't there to perform costly treatments on someone who's old enough they could die anyday from natural causes. Obama's idea of transparency is a blacked-out window. Write and call the White House and tell them we want to see the damned report NOW! I just read that your administration is delaying release of a budget report that is sure to include worse than your projected figures on the deficit and the state of the economy. 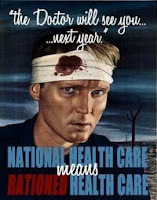 I recognize this as a delaying tactic in your propaganda campaign to socialize the health care system of this country. Your strategy in this case is precisely opposite of transparent. In fact it's downright deceptive. Release the report on time and be honest with the American people! Posted by John M. Allison III : Post Link --> 11:38 AM 1 Comments - Share Yours! Judd Gregg: "The President Doesn't Have A Plan"
Posted by kmorrison : Post Link --> 5:49 PM 0 Comments - Share Yours! 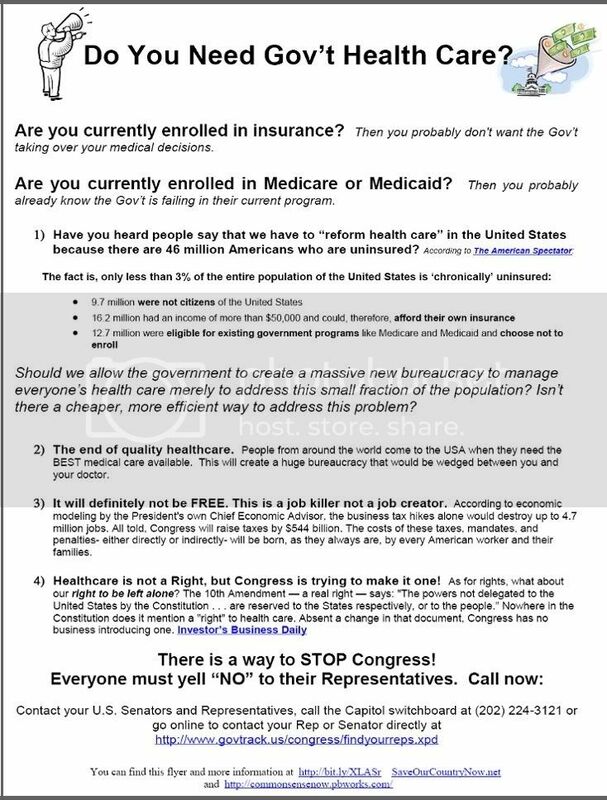 Here's a simple, straightforward flyer to get the message out on Obamacare. We still have a chance to stop this thing, let's keep the ball rolling. Here's an image of the flyer. You can download and print the pdf version here. *Originally posted at Save Our Country Now. Posted by John M. Allison III : Post Link --> 5:44 PM 0 Comments - Share Yours! Posted by kmorrison : Post Link --> 11:00 AM 0 Comments - Share Yours! House Democrats finally released their version of Obamacare a couple of days ago--all 1,018 pages of it. Cost estimates I've seen range from $1 trillion to $1.5 trillion with huge taxes to be imposed on businesses to attempt to pay for the monstrous program. It's bad enough they either don't care or don't get the fact that raising taxes in the midst of the worst recession in decades is a bad idea, but it gets worse when you see what we'll get for our $1 trillion plus investment. Republicans in the House were thoughtful enough to create the following diagram based on the Democrats' plan. It shows just how complicated navigation of such a system will be. Now, I thought it would be a good idea to contrast this with the current system. Because I've paid for my own health insurance for years now. I don't get it through my employer because it's cheaper for me to buy an individual plan. How do I afford it you ask? I prioritize. We have one 27 inch television in the house that I paid ~$400 for. I buy used cars and pay cash for them--no car payments, only need liability insurance. I mow my own lawn and basically do just about anything I can for myself instead of hiring it done. It's all about priorities. I've known too many people who have bass boats, brand new cars, and 4 wheelers, but can't afford health insurance. Yeah right. Priorities. Anyway, here's a look at the current system I deal with when I buy my own health insurance. I don't want to navigate the labyrinth and red tape to be created by Obama's plan. Do you? Posted by John M. Allison III : Post Link --> 11:54 AM 0 Comments - Share Yours! ARRA News Service -Yesterday, House Speaker Nancy Pelosi and other House democrats rolled out their health care plan called "America’s Affordable Health Choices." Part of their plan would force employers to offer workers health coverage or face severe fines. Also it would forcw individuals to participate in a health insurance plan or face penalties that would generally vary with their income level. Maybe it should have been called "Criminalizing of America's Health Care" or the "Destroy Individual Choices in Health Care." The Heritage Foundation is reporting the cost of the bill at $1.3 Trillion. The bill is 1,018 pages and comes to $1.264 billion per page. It even includes universal abortion coverage at taxpayer expense. The Congressional Budget Office, not a conservative "right minded" think-tank, reported that the health care reform plan proposed by House Democrats on Tuesday will add more than $1 trillion ($1,042 billion) to the national federal budget deficit over 10 years (2010–2019) . And, this is only their preliminary estimate of the damage. The CBO report states that its cost estimates are not comprehensive. They are only preliminary as administrative and other costs are not yet projected. Heritage advises, "But even this analysis understates the true costs of the bill. The CBO only scores bills on a ten-year time frame, and House Democrats have designed their bill to obscure the catastrophic long-term fiscal path on which it places our country." Heritage identifies that according to the CBO, the cost for the first four years is just $84 billion, but then it accelerates sharply. By 2019, the new entitlement is set to cost American taxpayers $254 billion. So while many Americans may look at the $1.3 trillion price tag over ten years and conclude the plan will cost $130 billion a year, in reality it will cost nearly double that. By backloading all the spending, the House is hiding the true cost of their plan from the American people. Between 2018 and 2019, federal costs for the new entitlement and the enlargement of Medicaid would increase by a combined 8.9%. Last week CNS News reported that Rep. Charlie Rangel (D-NY) introduced legislation calling for a $540-billion tax hike to pay for the health plan that President Barack Obama insists will be “deficit neutral.” This tax is a new surtax on households earning $350,000 and above. It starts at 1%, bumping up to 1.5% at $500,000 in income and to 5.4% at $1 million. 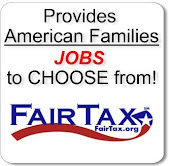 Since many small business owners fall within this income range, this surtax will also be a huge job killer. The Washington Post writes: [T]here is no case to be made for the House Democratic majority’s proposal to fund health-care legislation through an ad hoc income tax surcharge for top-earning households. …There is simply no way to close the gap by taxing a handful of high earners. … Pretending that “the rich” alone can fund government, let alone the kind of activist government that the president and Congress envision, is bad policy any way you look at it. Summary: President Obama, Democrats in Congress, powerful special interests and influential lobbyists are hard at work in Washington, D.C. trying to drastically change our current health care system. 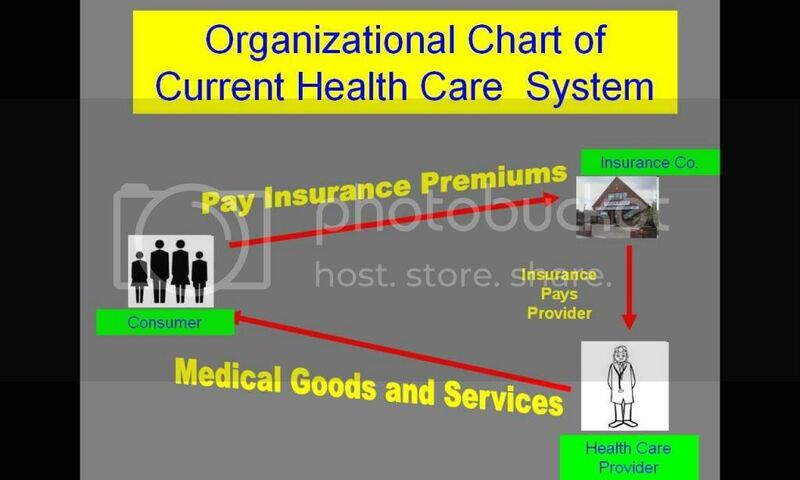 They are seeking to replace it with a "nationalized health care " system where the politicians and government officials will dictate the kind of medical services you and your family receive and the rules under which you access care and coverage. Read : Patients First - Vote No on Government Run Health Care and then take action. Posted by Bill Smith : Post Link --> 9:33 PM 1 Comments - Share Yours! Mother of Slain Iranian Protester, "I Will Not Be Silenced"
A 19 year old, Sohrab Arabi, disappeared more than 3 weeks ago after he participated in post election protests in Iran. His mother was told he was being held in Evin prison, and she routinely visited the prison trying to find information about her son. 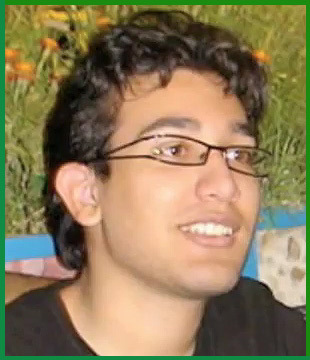 Sohrab was dead, reportedly killed as a result of torture. At Sohrab Arabi's funeral his mother called out the cowards who murdered him and proclaimed, "I won't be Silenced." Posted by kmorrison : Post Link --> 12:39 PM 0 Comments - Share Yours! by John Allison III at America, You Asked For It! A week ago, we saw Rasmussen's Presidential Approval Index (PAI) reach new lows, and it appeared to us that President Obama's radical change was becoming difficult to digest for the American electorate. Polling was suspended for 3 days over the Indpendence Day holiday, but barbecues, fireworks, and family vacations appear to have done little to make the President's policies more palatable. Since polling resumed following the holiday break, Obama's numbers have been on a steep and steady decline. Today's poll shows a mere 30% now Strongly Approve and 38% Strongly Disapprove of Obama's performance. That sets a new low for Obama's PAI at -8%. It's also the 7th consecutive day the Index has dwelt in negative territory. Until Obama found himself in this rut, the longest period the PAI remained negative had been 2 days. The declining overall Approve/Disapprove numbers in the Rasmussen poll are also deteriorating rapidly. Though the President still enjoys a slight majority of voters generally approving of his job performance, today marks Obama's lowest point reached since he took office with only 51% of likely voters who approve and 48% disapproving of his handling of the country's affairs. Other polls are showing similar trends that indicate the Rasmussen numbers are no anomaly. Yesterday, a Quinipiac University poll showed Obama's approval rating plummeting in the key battleground state of Ohio. Two months ago, 62% of voters in Ohio approved of the President's job performance and only 31% disapproved. The latest poll has only 49% approving and 44% disapproving--a drastic 13% swing in two month's time. On the economy, more Ohioans now disagree with Obama's radical policy changes than agree, by a score of 48% to 46%. In Quinipiac's May 6th poll these numbers stood at 57% and 36% respectively. Last month when the President's PAI began to slip, his Cairo speech to the Muslim world provided a bounce that pushed the Index back into positive territory for a few days. However, the bad news of results of Obama's radical policy changes kept coming. We saw the CBO estimates that Obama's plan would be far more expensive than we'd been told and would actually cover far fewer of the uninsured, leading to speculate that full coverage of all uninsured Americans would cost more than $3 trillion over the next 10 years. The President's foreign policy blunders bore fruit also as North Korea continued its belligerent actions in the face of the unenforceable UN resolution the President proudly held up as evidence that his apologetic, tail-tucking foreign policy put the US in a stronger position with the international community. Unbelievable, I know, but it gets worse. As the Iranian regime became emboldened by the new Obama-weakened US, it violently stamped out the flames of a pro-democracy insurrection while Obama went about without a care--eating ice cream and proclaiming he didn't want to "meddle" in Iranian affairs. The hypocrisy of our President then quickly became clear when the government of Honduras constitutionally evicted its sitting President for attempting to usurp the Honduran Constitution. Obama was quick to stand with his newest anti-American pals, Hugo Chavez and the Castro brothers, to "meddle" in Honduran affairs by proclaiming the constitutional actions of the Legislative and Judicial branches a coup de etat--a term generally reserved for unilateral military action to depose a government and install itself or its representative as the de facto government. In Honduras, the governmental system was left in place, only the would-be leftist dictator was replaced for violating the country's Constitution. Then there's the economy. The day before the official beginning of the 4th of July holiday for most Americans, the latest unemployment figures were released. Oh how the administration likely wished many were already away on vacation. The unemployment rate, already higher than Obama predicted it would have been without passage of his vaunted "stimulus" plan, continued to climb. As the economy keeps shedding jobs, the President's credibility with the American electorate continues to crash. In addition, more and more details of the "stimulus" plan continue to come to light and even the untrained eye is able to see many programs will have no stimulative effect on the economy. To put it concisely, everyday more Americans are awakening to the fact that we were conned into enacting the largest spending binge in American history for nothing more than ideological purposes. Promised jobs are not materializing, they're evaporating. Our deficit continues to climb with nothing positive to show for our expenditures. And in light of the obvious failures of his policies thus far, Obama and his cronies continue their fear-mongering cries to garner support of more of his sure-to-fail "reforms." Most Americans were willing to give him the benefit of the doubt, most wanted to believe in him and his policies. But you can't feed the American electorate excrement and call it chocolate forever. They just won't buy it. And dropping like a rock. Posted by John M. Allison III : Post Link --> 6:43 PM 0 Comments - Share Yours! Is the NRA Executive Director Waffling on Gun Rights & Judge Sotomayor? by Bill Smith, ARRA Editor: The Washington Times posted an article today titled"NRA raises concerns over Sotomayor." NRA Executive Director Chris W. Cox wrote in a letter to U.S. Senators, "The cases in which Judge Sotomayor has participated have been dismissive of the Second Amendment and have troubling implications for future cases that are certain to come before the Court. Therefore, we believe that America's 80 million gun owners have good reason to worry about her views." While at first glance it appears that the NRA is going to oppose the confirmation of Sotomayor, NRA members and American gun owners had better not get their hopes up that the NRA is best supporting them in this situation. For The Times' article leads off with the statement, "The National Rifle Association said Tuesday that it would actively oppose Supreme Court nominee Judge Sonia Sotomayor's confirmation if she is hostile to senators who press her about gun rights." What kind of wimpy statement is that? If The Washington Times article is incorrect, then NRA Director Cox needs to be all over The Times for a retraction. Also, the NRA needs to clarify that they are opposing the confirmation of Sotomayor. After all. who cares if she is hostile to the senators asking questions. Many of us would be hostile to today's senators asking us questions. What matters is that Sotomayor may be hostile to or at minimum dismissive of citizen's gun rights by holding that 2nd Amendment rights are only valid against Federal jurisdiction but are not valid rights protected within jurisdictions of the States. What's next, restriction of 1st Amendment free speech? All States upon admission as a State to the USA were required to ratify that they support the U.S. Constitution. Has the Supreme Court ruled that this ratification has no merit? If it has no merits, why should any State have to follow any amendment or requirement in the U.S. Constitution or for that matter, any of the laws passed by the Federal Government? However, if today's Washington Times report is correct, then America's 80 million gun owners are not being represented by the NRA and the NRA members are wasting their time with Chris Cox as NRA Executive Director. Silence or a wait to see "how Sotomayor treats the senators" are not options for the executive director of the NRA. Again, if the Times was in error, Director Cox your immediate attention and action are needed to remediate this situation on behalf of 80 million gun owners! Please, let us know what you have done to correct this situation with The Times and what you have done to send a clear message to the US Senate that the NRA is opposing the confirmation of Judge Sotomayor. Tags: 2nd Amendment, ARRA News Service, Bill Smith, Chris W. Cox, gun rights, Judge Sonia Sotomayor, nominations, NRA, US Supreme Court To share or post to your site, click on "Post Link". Please mention / link to America's Best Choice. Thanks! Posted by Bill Smith : Post Link --> 6:00 PM 1 Comments - Share Yours! by Michael Fenenbock, DeNuke Iran: Iran intends to become a nuclear power and Russia is their greatest enabler. This cannot come as news to anybody. So what's up with this summit in Moscow? President Obama just held talks with Putin and Medvedev and apparently never even mentioned Russia's support for Iran's nuclear ambitions. Surely the President knows about the Russian connection. It's not like it's secret. I mean, here's some of what's public knowledge. Russia is responsible for construction of the Iranian nuclear power plant at Bushehr. Russia is supplying Iran with nuclear fuel with no provisions for dealing with spent nuclear fuel. Russia has provided "blueprints" for Iran's development of a heavy water nuclear reactor. Official Russia turns a blind eye while Iran obtains uranium mining and milling technology from Russian companies. Russia is Iran's close partner when it comes to delivery systems - building missiles. At least seven Russian companies expert in missile technology are operating in Iran. President Obama says his principal foreign policy goal is to "remake America's image in the world." He wants to be liked. And to that end, while in Moscow, he delivered a "please like me" speech aimed at the Russian people. But this is Russia and in Russia you play by the Bear's rules. President Obama's speech was carried only on the least watched Russian TV channel (think C-Span). On the other hand, Mr. Putin's finger wagging lecture to Mr. Obama about the Cold War and American arrogance received extensive coverage on all Russian media. ARRA News Service previously posted the story In Honduras, Freedom Restored with subsequent story by Cliff Kincaid, Now, Kincaid provides a followup expressing concerns by the citizens of Honduras. This followup story highlights again the importance of our prior questions: Why is Mr. Obama not supporting the legal transfer of power in Honduras? Why is he siding with the Marxist governments in South America? They are mystified that an American president would want to return this Chavez puppet to power in Honduras. I continue to receive messages from Honduran citizens upset at the international media for their distorted coverage of the situation in the Central American country. The people support the ouster of Manuel "Mel" Zelaya, who is considered a puppet of Venezuelan Communist ruler Hugo Chavez. They are mystified that an American president would want to return this Chavez puppet to power in Honduras. "The recent action taken by our Congress is highly supported by several organizations in support of peace and democracy: the State General Attorney, the Supreme Court, the Armed Forces, the private organizations and especially many young people. Mr. Zelaya broke the law on several occasions even after the Supreme Court stated that it was illegal. He had no respect for our laws and our Constitution. "It's not a new fact to the international media what are Chavez intentions over Central and South America. And we in Honduras don't want that. We don't want to go back to socialism or communism. We still believe very strongly in our democracy and very strongly in our freedom... We should be an example to Central American countries as well as South American countries who have not yet been influenced by Chavez. "May God bless our small but courageous country. And I hope the international media investigate very deeply. Send your people here and interview people from Congress and Supreme Court. Thank you again for reading our side of the story. We want a democracy, peace, freedom, and a president who doesn't believe he is above the law. "Many people don't know where Honduras is, but after this, they shall remember that Honduras said no to socialism and communism. "I'd also like to say that I am shocked by Mr. Obama's comments. Doesn't he know Mr. Zelaya is allied with Chavez? Doesn't he know that Mr. Zelaya wants to do in Honduras what Chavez did in Venezuela, Morales has done in Bolivia, Correa has done in Ecuador, Ortega in Nicaragua, as well as what Castro has done in Cuba?" "As you already know we are living in a horrible situation in our country and feel very disappointed and frustrated because we don't have the support of the international community. "How is it possible that other governments support a liar, a corrupt man, a 'Chavez wannabe,' as he is called in some articles, who also has strong links to the drug dealing business? "It's amazing. They have made him a martyr. We keep writing and writing and thankfully some people have responded. We now see articles in the Washington Post, Miami Herald, New York Post, Wall Street Journal to name a few, in favor or our actions and understanding it wasn't a coup. And to tell you the truth, they should have done this before! He was out of control. "I'm asking you, what more can we do? How can we get more people to believe that what we did was the right thing? Have you seen his speeches? Do you notice how incoherent he is? Do you see how he lies? For us it is so obvious, and that is what I wonder... how is it possible that people so well-prepared, so educated like the people in the U.N. and the U.S. government believe him? How come they are now on the same side of Hugo Chavez? Hugo Chavez talking about democracy? It's unbelievable. And it hurts. "I love Honduras and it hurts to see that we are alone. It hurts because we have witnessed how he has stolen, abused his power and how he has created a huge war between the Hondurans. By paying poor people and promising them false things, he does have their support. He speaks to them about God. It's amazing and sad. And now we see how this people who are badly influenced are vandalizing, destroying businesses when they protest. We had gone to marches, and they are all peaceful. "We are a poor and small country, but we love our country and we support the Armed Forces as well as the new president. We don't want a corrupt puppet of Chavez. What more can we do?" Posted by Bill Smith : Post Link --> 9:10 PM 0 Comments - Share Yours! What's wrong with Obama's Independence Day Message? In his first Independence Day message to his supporters, the President demonstrated his fundamental misunderstanding of what is probably the most well known sentence of the Declaration of Independence. That's giving Obama the benefit of the doubt, because the alternative is he's intentionally misinterpreting the intent of the founders to manipulate the people and consolidate power. President Obama's interpretation seems to ignore that little word wedged between 'the' and 'of'--pursuit. Now, it's important to remember this document wasn't put together in a day. It wasn't something Jefferson put together in one sitting on a cafe napkin. Jefferson and the other founding fathers carefully chose their words to ensure their message to the King and the world was communicated effectively. The phrase "pursuit of happiness," survived the editing process and became permanently etched in the final document that initiated the formation of what would become the greatest nation on Earth. The first sentence references the lead phrase in the US Constitution. Our founding fathers sought to form a more perfect union, but the current President seems to interpret this as the dream of the perfect union. Our wise founders, by inserting that little adverb "more" into this sentence, recognized that perfection is unachievable. Some may have believed such an achievement is unattainable due to the fallibility of man, others may have based their belief on the understanding that each man has a different definition of the "perfect" state. But one thing is clear--the editors of Jefferson's draft would have struck the word 'more' if they wished to communicate that they sought the perfect union. Our founding fathers made clear their belief that the guarantee of personal freedom was the most important role of government. These great patriots recognized that the freedom to excel must be complemented by the freedom to fail. Their acknowledgment that man has an inalienable right to pursue happiness rather than attain happiness seems incomprehensible to our current President. The President and his Democratic lackeys in Congress believe the founders had it all wrong. In their minds, your personal freedom creates inequities in society that can only be corrected by regulation and legislation. Where the founders believed in an individual's right to the fruits of his labors, Obama and his ilk would have you believe the role of government is to equalize the distribution of those fruits among the populace. In their world, the man who works overtime or even two jobs to afford a larger house, a newer car, better health insurance, or even to treat his family to a vacation once in a while should be brought down to the same economic status as the man who chooses to work part-time, or not at all, so that he can sit on the sofa and watch Oprah or Dr. Phil. Rather than allow each individual to strive for his definition of economic success, Obama and his Socialist pals want to define success and, through regulation and legislation, force all Americans to fit that mold. There it is again--the perfect union. This is repetitive I know, but it seems our President can't grasp such a simple concept so I'll go on. I don't know about you, but I'm not acquainted with anyone who hasn't struggled at some point in their lives. I'm sure they exist, but they're few and far between. Again, the founders' understanding that no such "perfect union" could exist is evidenced in the Constitution by the little adverb "more." They didn't dream of a perfect union in the Utopian sense, they dreamed of a "more perfect union"--meaning better than the one that existed at the time. To create a perfect union would require the existence of a perfect human being(s) and I believe the Bible when it says there is no such thing. The President has described the Constitution as a document of "negative liberties" and he's right, if you believe the Constitution was written to guarantee rights to our federal government. However, the fact is the Constitution wasn't written to secure the rights of government, but the rights of the governed. It follows then, what the President views as "negative liberties" granted the federal government become simply "liberties" enjoyed by citizens. Those liberties, especially the right to be as successful as one chooses, are precisely what allowed the United States to become the greatest nation--the most charitable, the most innovative, the most powerful--on Earth in less than 200 years. Remove those liberties, through taxation, legislation, or regulation, and we may well achieve economic equality for all. But at what price? The cost of such equalization will be borne by all Americans. Innovation will evaporate. When the prospect of reaping the financial rewards for building a better mousetrap is stripped from our society, we'll be stuck with the mousetraps of today. Our health care system may be expensive, but we're paying for the innovation that continually increases the lifespan of our citizens. The President and his cronies are currently hyping a government system that will eliminate the financial rewards for such innovation and result in the stagnation of medical discoveries, thereby stifling advances that would continue to increase longevity in the future. Obama's 4th of July message implies that his reforms will move us closer to a "perfect" union, one in which all our countrymen are guaranteed an equal share of the nation's economic pie. The end result of such ideology will be a reduction in the size of that pie so that all Americans will have a smaller portion, but they'll all be equal. This was not the founders' intent. The system envisioned in 1776 rewarded hard work and personal responsibility. The President and Democrats in Congress seek to reward the opposite by punishing those traits so valued by our founding fathers. It seems the founders, or at least Benjamin Franklin, knew this day would come. Tags: 4th of July, Barack Hussein Obama, Constitution, Independence Day, liberty To share or post to your site, click on "Post Link". Please mention / link to America's Best Choice. Thanks! Posted by John M. Allison III : Post Link --> 12:23 AM 0 Comments - Share Yours! ARRA News - The Fourth of July is a day that is usually a time when families get together for sunshine hot dogs, fun, and fireworks. Every American regardless of race, gender, income, and political party celebrates the day that the Founding Fathers signed the Declaration of Independence, spurring the start of the American Revolution. Like many other national holidays, the meaning can often be lost in the festivities. And so it is up to each of us to, in the words of Jefferson, "Educate and inform the whole mass of the people... They are the only sure reliance for the preservation of our liberty." The American system of government, with the Founding Father's emphasis on "life, liberty, and the pursuit of happiness," has inspired almost every country in the world to rise up and take control of their own destiny. Constitutional Republics have spread throughout Europe, and just this year fellow freedom fighters as far away as Iran and as near to us as Honduras are standing up for their own independence much like our Founding Fathers did more than two centuries ago. This is America's lasting legacy. Before 1776, only two Constitutional Republics even attempted to bring any form of freedom and liberty to mankind: The Greek and Roman Empires. But the people of these great nations became apathetic, not realizing, as John F. Kennedy wisely warned, "Complacency is the jailer of freedom." Tags: 2009, 4th of July, ARRA, ARRA News Service, Independence Day, William Warren, political cartoon To share or post to your site, click on "Post Link". Please mention / link to America's Best Choice. Thanks! Updated Comments at the bottom. Breaking News: Sarah Palin to Resign as Alaska Governor on July 26. "I am determined to take the right path for Alaska even though it is not the easiest path" In a stunning decision, Alaska Gov. 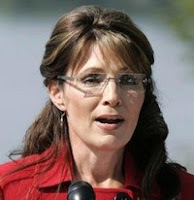 Sarah Palin (R) announced this afternoon she will resign as Governor of Alaska on July 26 and return to private life. Palin made the surprise announcement from her home in Wasilla, flanked by her husband, Todd, and family and state commissioners. Palin said: "I look forward to helping others - to fight for our state and our country, and campaign for those who believe in smaller government, free enterprise, strong national security, support for our troops, and energy Independence. We are not retreating, we are advancing in a different direction. We know we can effect positive change outside government at this moment in time." Bill Smith, ARRA Editor: "While many say this move was stupid, Sarah Palin has proven to be smart like a fox and as tough as a barracuda. She is a great speaker, rallies crowds and raises lots of money. If she plans to run for national office or even to just make a stand for the good of America, this may be the best move for all conservatives. I am not prepared to count her out of politics. She has a lot of faithful supporters throughout the lower 48." U.S. Rep. Peter King (R-Seaford, NY) said the following on learning of her decision: "I don't know how you'd do it from Alaska. It's another world geographically, politically and media-wise... It would give her an opportunity to break loose from the chains of local politics and a very small population with a lot of ancient feuds, where you're bogged down by the Lilliputians there." She can be on a national stage more often, he said, adding: "She's a lightning rod. That can be good for her...We have a lot of boring people in the Republican party.... she certainly engages." Updated 4:50 pm: Dr. Stephen Maloney, DraftPalin2012: Essentially, Sarah was being held "prisoner" in Alaska because of the endless whining that took place in The Anchorage Daily News and elsewhere whenever she ventured out-of-state. Sarah is a national figure with national aspirations, and it's in her best interest not to continue to serve as Governor. It's that simple folks. Some "conservative pundits," generally as idiotic as their liberal counterparts will express bogus horror that Sarah has "quit her day-job." Frankly, Sarah doesn't want to run for President on the state of Alaska's dime. Obama quit as his own day-job, as U.S. Senator -- or at least stopped performing it -- after serving less than a year. Nobody raised a peep. 5:46 pm: Gary Bauer, Campaign for Working Families: My reaction: Reports of her political death are greatly exaggerated. Yes, resigning as governor is high risk, and, yes, the Left's attacks on her have been savage enough to drive almost anyone out of office. But I don't believe she's running from a fight. This move frees her up to campaign in the lower 48 states, build a top notch political organization and improve her issue development work. In six months we will know whether the gamble worked, but I for one am hoping it does. Whatever happens, every day I am more convinced that working together we are going to get Barack Obama out of the White House. The plant makes windmill blades. 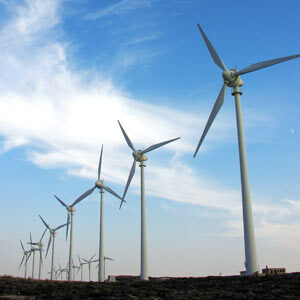 You know, those giant windmills that produce clean energy that were going to sprout from the ground like spring daisies if the stimulus bill passed. These are green jobs being lost--the very jobs Obama announced would be created by HIS economic package. Perhaps our President's mathematical magicians will spin this as Obama saving 300 jobs. So we're losing green jobs, and non-green jobs, even though Congress has bowed and given the community organizer virtually everything he's asked for, everything that he insisted would turn our economy around and result in millions and millions of green jobs. Where are they Mr. President? How long will worshippers of the Obamessiah go on believing his nonsense? His supposed stimulus is a failure on all fronts. Posted by John M. Allison III : Post Link --> 11:15 AM 0 Comments - Share Yours!